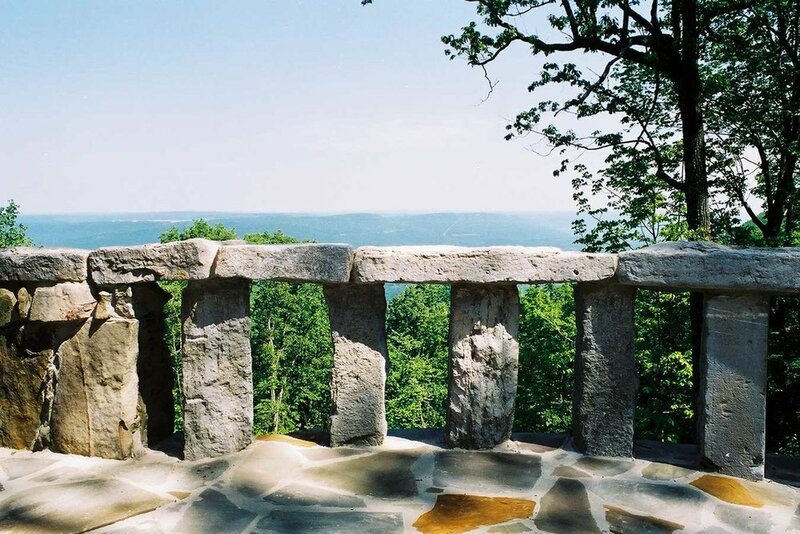 Situated on the west bluff of Lookout Mountain, Tennessee, this mountain home is rich with outdoor places. A range of covered porches, open wood decks, and stone terraces offer a variety of places for outdoor living and spectacular views of the valley below. The building is cut into the mountainside, with a sunken stone patio and steps carved into the ground. It is only after descending the stone steps, passing under the second floor wing above, and out to the bluffside terrace, that the panoramic view opens up before you. It is built as a stone outcropping, similar to the bluff on which it sits, supporting a wooden framework above. The homeowner had been collecting stones for the house over the years, salvaging many from local road curbs and garden walls. Some of them were originally cut by his great grandfather Stein ("stone" in German), a stonecutter. He asked that stones to be a dominant material of the house, and that they be rough and irregular like the mountain bluff. The dining room opens onto a trellised terrace on the south side, with outdoor fireplace for indoor/outdoor eating. In winter, the stone columns, wall, and floor slab provide thermal mass, absorbing solar radiation passing through this high wall of south-facing glass. In summer, winds from the valley naturally cool and ventilate the space. Stone columns march from outside to inside to support the roof beams of the main living space. It is a house literally of its place, with all interior trim and flooring manufactured on site, cut from heartpine timbers recycled from a Chattanooga warehouse, and stones salvaged from downtown Chattanooga streets, assembled to frame beautiful views of the surrounding Lookout Mountain landscape.